We are brought into this world with no talents or aspirations. But, many of us follow our dreams and desires, pave our path, and find our calling. This is the case with Jeremiah Jurgeson, a young, but wise, man at only 25 years of age. Jeremiah obtained his PHD from Harley Davison when he was 19 years old and has since worked as a master mechanic at a local HD dealership. 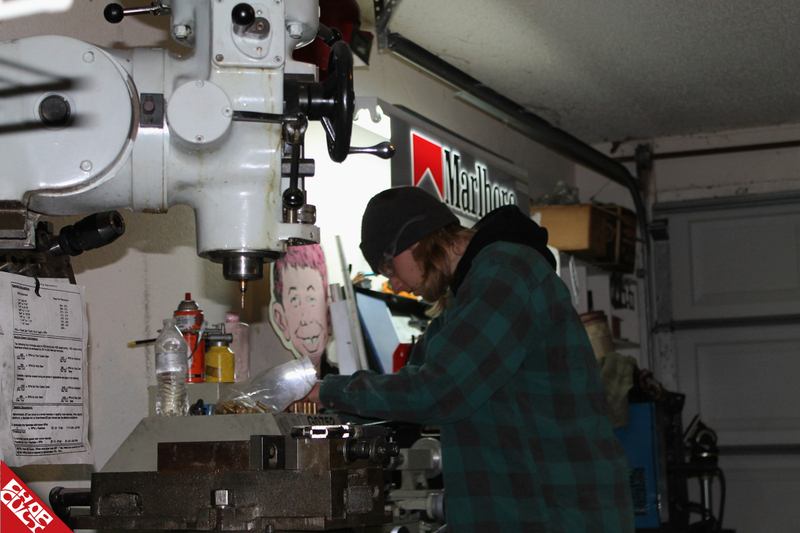 During his free time, he started Conflict Machine in his garage, where he has been machining parts for almost two years now. He also has been an avid builder over the last few years and has obtained a spot in the Show Class People’s Champ Top 25. I met Jeremiah last year on a tribute ride for Larry Pierce and he and I have become good friends since. Jeremiah is a genuine person and is always willing to lend a helping hand to his friends. I was fortunate enough to sit down with Jeremiah and get a firsthand look at just what happens at Conflict Machine on a daily basis. Jeremiah offers all types of machining for your needs, but he has been working diligently on a new product to add to his line of goodies. Jeremiah spent 8 months doing R&D on his now available wooden magneto covers. I have seen this product firsthand and it is truly an art piece. The quality is outstanding and the craftsmanship is flawless. Jeremiah plans on growing his product line and moving forward expanding the business, offering the consumer quality USA made products at a fair price. His main goal is to become an industry leader with new and innovative products. The thing that makes Jeremiah stand out from most is that he wants to offer a quality product that the consumer can be proud of. Jeremiah would like to thank all of his friends and mentors along the way. They have helped drive him into wanting to be a successful parts distributor while maintaining integrity and respect for those buying his products. He would also like to thank all of the people that have purchased his products or used his machining services. Lastly, thanks to Chop Cult for supporting all of the chopper community. "You guys are truly the best!" Kindly give ChopCult member Jeremiah a follow here and on Instagram. Love my conflict machine mag cover! Metal and wood, what a nice combination. What is that wood, Padauk? Such a solid dude. I have a lot of love and respect for this guy. Made my day. Keep up the good work B! The wood is south American Ipe I'm pretty sure. This young man has heart, in a big way. Not to mention courage to pursue his dreams. He represents the type of person/business that deserves our respect and loyalty. Great article Jason! So cool to see friends on here. That guy works incredibly hard. Definitely a good dude. Met him for the first time a few weeks ago, had bike issues at a gas station. Stopped to see if I needed help and went out of his way to grab tools and came back to get the bike going again. I feel like an idiot. What is that wooden piece? Whatever it is it's beautiful and I want it on my bike. is there a link to them directly? google search turned up a bunch of results and this is the only one i found that took me to the covers. is this their actual site?